It's been so long since I've done a written review, I had to look up my review format before I started! RAP4 was kind enough to send me a Land Warrior II Video Camera for review, and with this being my first usage and review of a paintball camera, please bear with me (and forgive me not touching on something in particular you want to see, let me know if miss anything). Note: I haven't had a chance to upload any of my footage as I want to polish it/make something interesting out of it, when I do upload it I'll be sure to post it here. Pros: One of the things that first struck me when I started reviewing the Land Warrior was how well they did in not limiting themselves to proprietary or non-changeable parts. What I mean by that is the batteries are easily removable/recharged and can be easily replaced (for little cost), when compared to many other cameras that use either costly non rechargeable AAs or integrated lithium ion batteries. Also, the use of a Micro SD card as opposed to integrated memory allows the user to easily swap out cards, even on the field. Those two things combined mean that the end end user can swap out batteries and cards on the field indefinitely, thereby only limiting the possible amount of video recorded to the number of batteries/cards owned. Another great plus is the use of an integrated LCD screen (which can be turned off, if you're playing at night and don't want to be given away), something which even some of the very high end camera systems out there fail to include. AND, as a very cool bonus feature that I discovered, you can use the included RCA cables (normally used for playback on TVs of recorded material) as a live viewing mechanism. That is to say, if you had a compact LCD screen and a battery set-up, you could create some kind of cornershot-ish system with your Land Warrior and a picatinny-railed paintball marker. Or, conceivably, if you had a means of broadcasting the RCA signal you could even have a Ghost Recon style live view of your teammates viewpoints. Cons: I had some initial problems with the first unit RAP4 sent me, but they were very accommodating and sent me another unit that worked perfectly. There aren't very many things I don't like about this camera, but the cons for me lie in features that I think RAP4 would benefit from adding to the Land Warrior. While 720x480 is going to be enough for most users (and the quality for the resolution is good), the trend for many cameras that I see online is HD recording, so for the price that it's sold at, I think it would be a good idea for the Land Warrior to include HD resolution. The other feature I'd like to see added would be an ablative lens to place over the front of the Land Warrior, so if the lens was broken by an especially brutal paintball hit (although I'm not sure that would break the lens included), it could be replaced by a new one. Overall: The Land Warrior II has a lot of features I truly enjoy (see Pro: section), and it's nice to see somebody creating a camera specifically designed for paintball/airsoft. The ability to switch out memory and batteries is a huge plus for me, as the last thing you want to do on the field is be stuck with a video camera with a full memory card or with carelessly drained batteries. 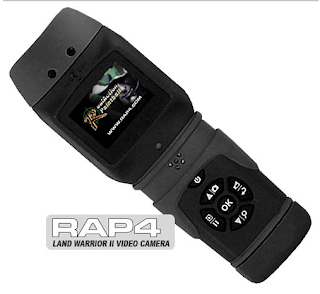 If you're looking for HD recording capability, then you're SOL with the Land Warrior II, but hopefully RAP4 will implement such a feature in the future (Land Warrior III? ).